Every sales manager I’ve ever talked with has agreed on one thing: The single biggest challenge salespeople have is closing the deal. There are two reasons closing is such a big problem. One is psychology. The other is physics. That’s right, physics. Let me explain. When we’re selling (and especially when we’re closing), we have to deal with two big fears. Fear is a powerful motivator in ways both good and bad, so it’s critical for us to understand how these fears affect us and how to overcome them. The first is the fear of rejection, a natural fear for most of us. Nobody enjoys being rejected—it bothers all but the thickest-skinned of us. So too often, we don’t make any attempt to close, because if we don’t ask for the sale, we can’t be rejected. 1. The prospect wants and/or needs what we’re selling. 2. A sales rejection is not a personal rejection. 3. If the prospect says no, we’re no worse off than before. The second fear is more pernicious because we’re typically not even aware of it. Most of us are afraid of being perceived as the stereotypical “salesperson” so commonly portrayed in popular culture: pushy, rude, slimy, underhanded, obnoxious. Because we (subconsciously) fear being perceived as this stereotype, all too often we don’t really try to close the prospect. But closing is a critical part of the sales process, arguably the most critical part. You can do everything else right—prospecting, needs analysis, presentation, overcoming objections—but if you don’t close, there’s no sale. Here’s the secret to overcoming this fear: understand that prospects need you to close them. Why? Physics! The prospect is sitting there (or possibly standing there) in a state of inertia. 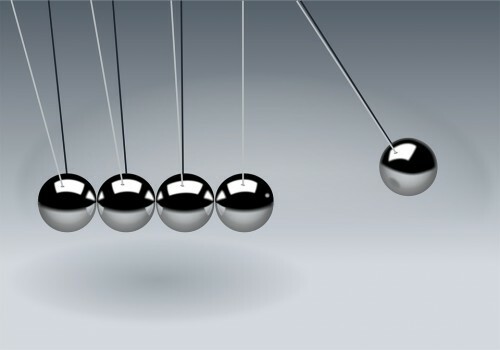 Remember the Law of Inertia? “A body at rest tends to stay at rest.” Which means the prospect’s natural inclination is to do nothing, even though they need and/or want whatever it is you’re selling. However, the Law of Inertia continues: “unless acted upon by an outside force.” That’s us! We need to be the outside force that acts upon our prospects to change their state. It doesn’t need to be a BIG force, however. It can be a gentle nudge. So don’t think of closing as pushing the prospect into doing something they don’t want to do. Instead, think of it as nudging the prospect just enough to move them out of their inertia and into action. When you think of it in these terms, closing is not at all pushy, rude, slimy or obnoxious. In fact, assuming this purchase really is in the best interest of the prospect, then not closing is a disservice to them, because it’s preventing them from enjoying the benefits of your product or service. Remember, it’s not the prospect’s job to ask us to sell them our stuff. (Left to their own devices, they often won’t, due to that pesky inertia.) Instead, it’s our job to ask them to buy it. And they need us to do it. After all, we’re only battling fear. They’re battling physics.